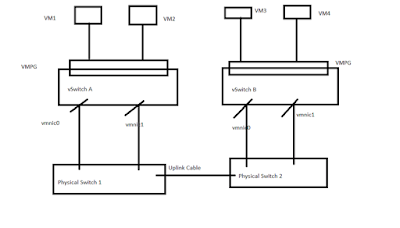 In VMware we talk about two different type of Virtual Switches Standard Switches (VSS) and Distributed Switches (VDS). Here will be focussing on the standard switches and maybe i will dedicate another article separately for discussion on Distributed Switches. Let's Begin by answering a simple question what is a Virtual Switch? Is it exactly the same as Physical Switch. The Answer is No because we can connect two physical switches together with the help of a cable but that's not the case with the Virtual Switches. Two Virtual Switches can not be connected directly with the help of an cable. The network cannot be configured to introduce loops. As a result, Spanning Tree Protocol (STP) is not needed and is not present. Each virtual switch has its own forwarding table, and there is no mechanism to allow an entry in one table to point to a port on another virtual switch. In other words, every destination the switch looks up can match only ports on the same virtual switch as the port where the frame originated, even if other virtual switches’ lookup tables contain entries for that address. Then how the communication works in case of Virtual Switches (Standard Switches)? 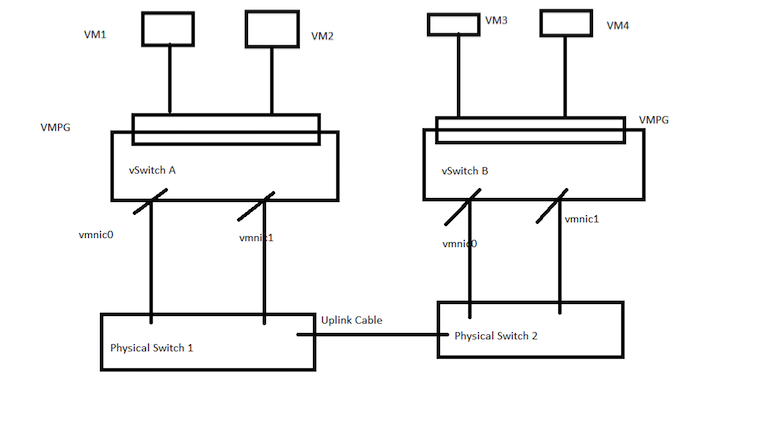 In the Below diagram i have created two Virtual Machines on each vSwitch and shown how exactly the communication works. Each of my Virtual Machines has their own NIC cards and are connected to Virtual Machine Port Group (VMPG) created on vSwitch. Why do we need to create a VMPG ? - For VM to VM communication and VM to outside world communication. VMNIC's shown in the diagram are the NIC cards on my Esxi host connected to the ports on the Physical Switches helping my VM's to talk to outside world. We can also see that the two Physical Switches are connected well this is an example to explain how the communication works. So If VM1 want's to communicate to VM 3 then they have to talk to each other with the help of VMNIC's connected to physical Switches. VMkernel Ports: * Need to be created on Standard Switches for carrying the below traffic types.